Colony at The Ritz-Carlton, Millenia Singapore is one of the most stunning restaurants in Singapore. And it is one destination that suits every occasion—business luncheons, anniversary dinners, birthday celebrations and family gatherings. During our previous visit to Colony, we were blown away by the extensive buffet dinner spread which features seven ‘live’ kitchens. Fast forward a few months and we are back at this colonial-themed restaurant for “The Journey”—a five-tier tiffin afternoon tea (S$49++/pax) which is now available from Monday to Saturday, from 3.30pm to 5.30pm. Lounge your afternoon away in this gorgeous setting and chit-chat over savoury delights served in a five-tier ceramic tiffin and unlimited servings of delectable desserts from The Patisserie, a complimentary flute of champagne and Colony’s custom tea blend. 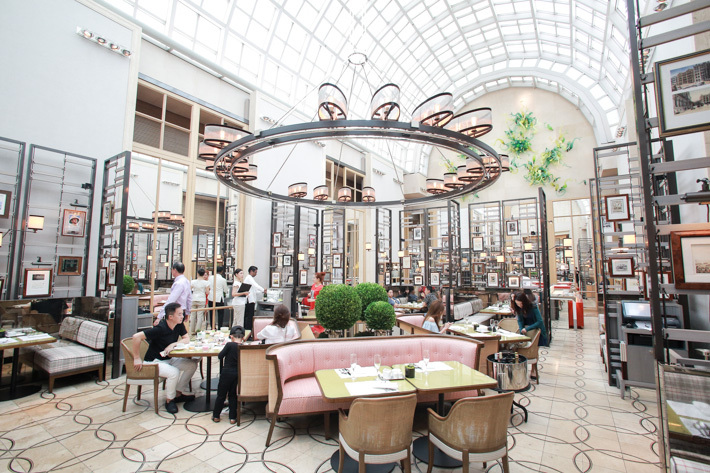 Colony is where a wonderful afternoon tea journey happens. And for readers of Ladyironchef, enjoy a privileged 15% discount when you quote ‘Ladyironchef15′ upon reservation. While we loved the dim lighting and romantic setting during dinner, we were awed after stepping foot into the restaurant for the first time in the day—natural lighting shines through the mother-of-pearl glass roof and brightens up the restaurant space. The theme of the restaurant is set in the late 18th century when trade started flourishing in Singapore, paying tribute to the sea voyages and commercial travels by the British to the Far East. Adding to the colonial touches are a series of vintage portraits, maps, and photographs displayed on the wall partitions. Those who prefer a more private setting can opt for one of the dining booths perfect for groups of two and four. Travel back in time through Singapore’s culinary heritage as you savour Chinese, Western and locally inspired canapés presented in a ceramic five-tier ”Tingkat”, the Malay word for tiffin. 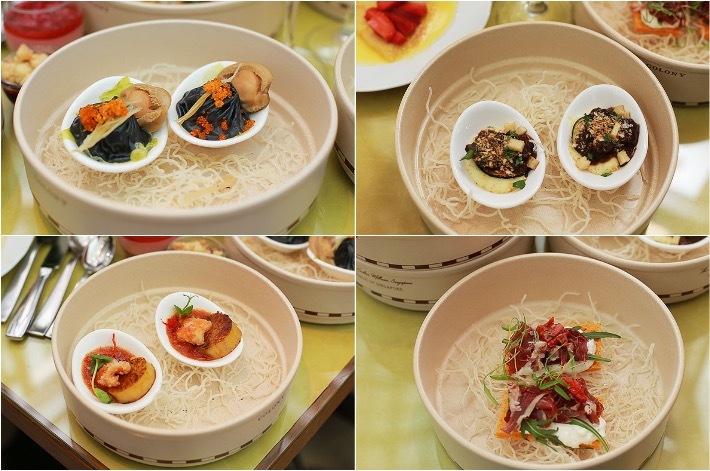 Journey through savoury highlights such as Steamed Charcoal Xiao Long Bao with Baby Abalone, Beef Parmentier, Mini Lobster Thermidor and Pumpkin Cake with Chilli Crab Meat Sauce. Do note that the menu is subjected to change. It is no secret that we love Xiao Long Bao, and we have seen quite a few creative variations of mini soup dumplings in recent years. And just when we thought we have seen it all, Colony comes up with their rendition of the Steamed Charcoal Xiao Long Bao with Baby Abalone. A generous portion of pork filling and tasty broth are enwrapped in a delicate, black dumpling skin providing a burst of flavours at first bite. 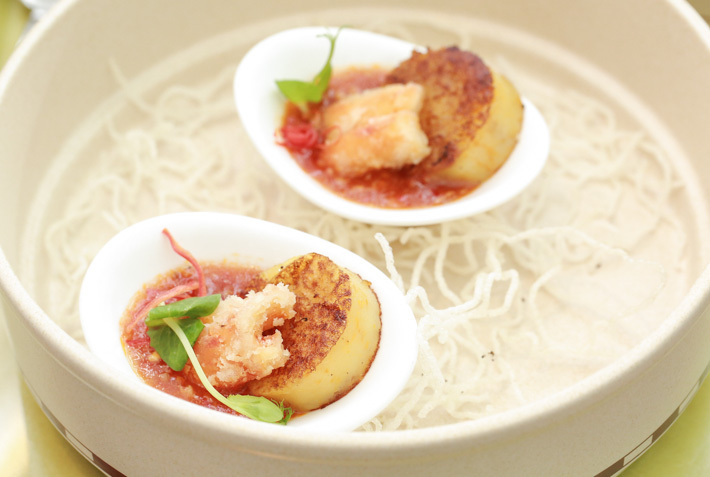 The Baby Abalone adds a premium touch to this exquisite dim sum dish. Another star dish melding flavours from the East and West would be the Pumpkin Cake with Chilli Crab Meat Sauce. Here at Colony, the chefs have mastered the art of making rich and flavourful chilli crab sauce. The wonderful combination of sweet and mildly spicy flavours definitely makes this a crowd-pleaser. The Beef Parmentier is a winning combination of soft and tender beef chunks, complemented with creamy mashed potato. With the Mini Lobster Thermidor, a classic French dish, you can enjoy a portion of succulent lobster meat drizzled in cream sauce, and baked with cheese to perfection. There is also the Ibérico and Burrata Cheese Sandwich, a Western favourite. The intense flavour of the cured ham is well-balanced by the smooth, buttery texture of the burrata. The best part? 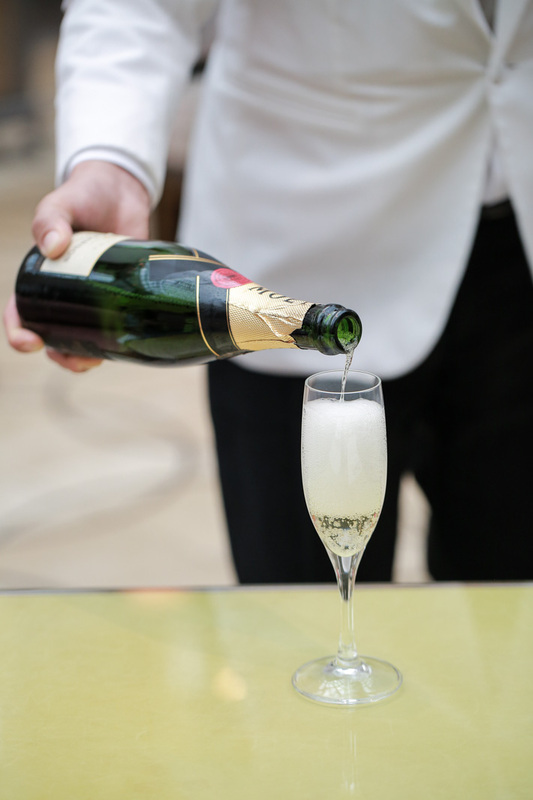 You get to experience this journey through various cuisines with a flute of Moët & Chandon Brut Imperial Champagne and Colony’s custom tea blend, made from black and white Sumatran tea leaves! You can even personalise your tea with your choice of tea syrup enhancement such as French Rose, Pandan or Lavender. The Pandan enhancement was definitely the popular choice, as all of us had several cups of tea just to pair with the fragrant Pandan enhancement. A trip to Colony is never complete until you make your way to the ‘live’ crêpe suzette station. Capture the Instagram-worthy moment as the pastry chef light the pan with a torch —a dramatic instant that makes for great photos or videos. Though the canapés in the five-tier tiffin are not refillable, your sweet tooth will be satiated with unlimited servings of desserts from The Patisserie in Colony. Look out for the lemon meringue, raspberry cheesecake and mini pandan roll. There is also an assortment of Nyonya kueh, alluding to another of Singapore’s heritage cuisines. ‘The Journey’ is one of the best afternoon teas in Singapore that we’ve had this year and we are already looking forward to more tea sessions at the gorgeous Colony! For all of our beloved readers of Ladyironchef, experience ‘The Journey’ with a 15% off by simply quoting ‘Ladyironchef15′ upon making your reservation. Do note that this promotion is redeemable only with a minimum of 2 diners, and it is valid from 28 November 2016 to 17 December 2016. This post is brought to you by The Ritz-Carlton, Millenia Singapore.